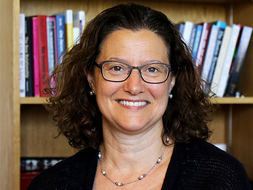 Dr. Janet Boguslaw is Senior Scientist/ Senior Lecturer and Associate Director of the MPP program at the Heller School, and Senior Fellow at the Institute on Assets and Social Policy. Her work focuses on creating multi-sector innovations and partnerships to advance economic opportunity and stability through both voluntary and policy-driven initiatives. She is an experienced practitioner, evaluator, and researcher in the areas of workforce and economic development with a focus on job quality, family financial stability, and gender and asset based inequalities. Dr. Boguslaw has worked with corporate managers to research, direct and advance their community development initiatives, with state agencies in the areas of workforce training and employment stabilization, and on funded research exploring issues of regional development. She currently teaches the courses Sociological Inquiry: Transformations in Work; Gender, Work, and Inequality; Policy Perspectives on Woman, Work and Inequality. Boguslaw, Janet and L. Shur. "Building the Assets of Low and Moderate Income Workers and their Families: The Role of Employee Ownership". New Brunswick, NJ. Institute for the Study of Employee Ownership and Profit Sharing, School of Management and Labor Relations, Rutgers University: 2019. Boguslaw, Janet. "How Workforce Investments Leverage and Create Employee Value." Investing in America’s Workforce: Improving Outcomes for Workers and Employers. vol. 2 Ed. Anderson, S. ,T.Greene, H.Prince, C.Van Horn. Kalamazoo, MI: W.E. Upjohn Institute for Employment Research, 2019. Part 2 Chapter 11 pg 163-182. Boguslaw, Janet, Sarah Souri. "Structuring Firms to Benefit Low-Income Workers." Employee Ownership and Employee Involvement at Work: Case Studies. vol. 18 Ed. Daphne Berry and T. Kato. UK: Emerald Group Publishing, 2018. 153-158. Boguslaw, Janet. "Valuing Workers through Shared Capital Investments." Investing in America’s Workforce: Improving Outcomes for Workers and Employers. vol. 2. Part 2 Chapter 7 (103-114) Ed. Anderson, S., T.Greene, H.Prince, C.Van Horn. Kalamazoo, MI: W.E. Upjohn Institute for Employment Research, 2018. 103-114. Boguslaw, Janet, J. Hoffer Gitell. "Relational Coproduction and Relational Welfare - An Asset Based Approach to Achieving Social Well-Being." KOGNITION & PÆDAGOGIK no 100 Vol. 26, no 2 / KP162. (2016). Boguslaw, J., Behe, K., Taylor, J.. Strategic Philanthropy: Integrating Investments in Asset Building- A Framework for Action. San Francisco, CA Asset Funders Network: 2015. Gaiser, M. D., L. Nsiah Jefferson, J. Santos, S. Venner, J. Boguslaw, T. Tellez.. "Culturally Effective Organizations: A Framework for Success". Waltham, MA: Institute on Assets and Social Policy, Brandeis University. : 2015. Loya, B., J. Boguslaw, M. Erickson-Warfield.. "Empowering Prosperity: Strengthening Human Services Impacts through Asset Integration. A Guidebook for Discussion and Action". Waltham, MA. Institute on Assets and Social Policy and the National Assembly for Human Services: 2015. Loya, R., Mann, A., Boguslaw, J, T. Shapiro. "Tipping the Scale: How Assets Shape Economic Wellbeing for Women and Families". Waltham, MA Institute on Assets and Social Policy: 2015. Santos, J., Boguslaw, J., Venner, S.. "Strengthening New Hampshire's Health Care Workforce: Strategies for Employers and Workforce Development Leaders". Waltham, MA Institute on Assets and Social Policy, Brandeis University: 2015. Santos, J., J. Boguslaw.. "The Networked Workforce: Maximizing Potential in Health Careers.". Waltham, MA. Institute on Assets and Social Policy: 2015. Boguslaw, Janet, M. Cronin, E. Paulhus. "State Asset Building Coalitions: Perspectives from the Field" Institute on Assets and Social Policy, Waltham, MA.. 2014. Thomas, H., J. Boguslaw, S. Chaganti, T. Shapiro.. "Keeping dreams alive: the lane-changer costs of financial disruptions" Leveraging Mobility Series #3. Institute on Assets and Social Policy, Waltham, MA: April: 2014. Thomas, H.,T. Meschede, A. Mann, J. Boguslaw, T. Shapiro. "The Web of Wealth: Resiliency and Opportunity or Driver of Inequality?" Leveraging Mobility Series #4. Institute on Assets and Social Policy, Waltham, MA: July. 2014. Boguslaw, Janet and Elizabeth Paulhus. "Strategic Philanthropy: Creating Opportunity, Building Wealth, and Driving Community Change". San Francisco Asset Funders Network: 2013. Boguslaw, Janet, S. Venner, J. Santos, L. Nsiah-Jefferson. "Perspectives and Practices of NHHealth Care Employers: Improving Quality, Reducing Costs, and Planning for the Future by Building Culturally Effective Health Care Organizations". Institute on Assets and Social Policy, Waltham, MA. : 2013. Boguslaw, Janet. H. Thomas, L. Sullivan, T. Meschede, S.Chaganti, T. Shapiro.. "Hard Choices: Navigating the Economic Shock of Unemployment". Washington, D.C. The Pew Charitable Trusts: 2013. Thomas, H., J. Boguslaw, S. Chaganti, A. Atkinson, T. Shapiro. "Employment Capital: How Work Builds and Protects Family Wealth and Security" Leveraging Mobility Series #2. Institute on Assets and Social Policy, Waltham: MA December. 2013. Thomas, Hannah , Janet Boguslaw, Alexis Mann, Thomas Shapiro. "Leveraging Mobility: Building Wealth, Security and Opportunity for Family Well-Being" Leveraging Mobility Series #1. Institute on Assets and Social Policy. Waltham, MA: October. 2013. Boguslaw, Janet and Mary Ellen Boyle. "Investments at the Base of the Pyramid: Reducing Poverty Through Sustainable Asset Development." Sustainability Challenges and Solutions at the Base of the Pyramid: Business, Technology, and the Poor. Ed. Kandachar, Prabhu and M. Halme. Sheffield: UK: Greenleaf Publishing, 2008. 261-281. Boguslaw, J., Boyle, M.E.. "Business, Poverty, and Corporate Citizenship: Naming the Issues and Framing Solutions." Journal of Corporate Citizenship 26 (2007): 101-120. Boyle, M.E. , Boguslaw, J.. Asset Policy as an Anti-Poverty Strategy: A Symposium on Corporate Involvement. Proc. of Annual Conference of the International Association of Business and Society. Santa Rosa, CA: 2005. Boguslaw, J.. "Have We Arrived? Only when the integration of stakeholder interests becomes 'business as usual'." Accountability Quarterly 19 (2002): 52-58. Boguslaw, J.. Social Partnerships and Social Relations: New Strategies in Workforce and Economic Development. New York: Routledge, 2001. Rochlin, S., Boguslaw, J.. "Integrating Business and Community Development: Winning Management Practices. In Innovation, Learning and Performance." Accountability Quarterly 16 (2001). Rochlin, S., Boguslaw, J.. Business and Community Development: Aligning Corporate Performance with Community Economic Development to Achieve Win-Win Impacts. The Center for Corporate Citizenship at Boston College, The Wallace B. Carroll School of Management. Newton, MA: 2001. Rochlin, S., Boguslaw, J.. Case Studies:- "J.P Morgan Chase: Driving Business and Community Development Across the Organization. "- Advanced Micro Devices: Creating Strong Communities and Business Through Regional Workforce Development Partnerships.- Safeco's Urban Marketing Initia. The Center for Corporate Citizenship at Boston College, The Wallace B. Carroll School of Management. Boston, MA: 2001. Siegel, B, , Kwass, P., Boguslaw, J. , et al.,. "Jobs and the Urban Poor: Publicly Initiated Sectoral Strategies" Final Report, Vol I. and Case Studies, Vol.II.. Final research report to the Ford and Mott Foundations, Mt. Auburn Associates. Cambridge, MA: 1995.